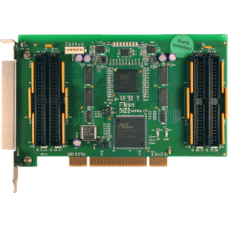 The MESA 5I22 is a general purpose programmable I/O card for the PCI bus. The 5I22 uses a 1 or 1.5M gate Xilinx FPGA for all logic, so it is truly an Anything I/O card. 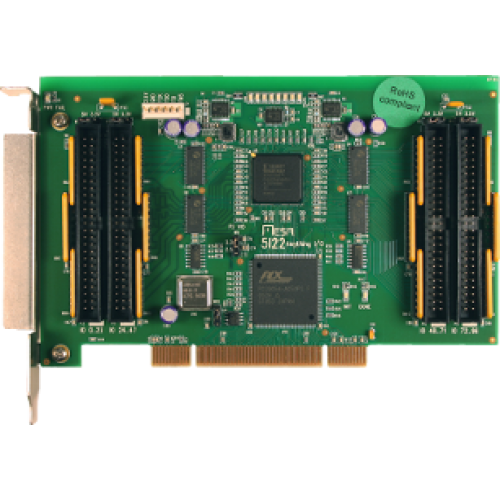 The FPGA is downloadable from the PCI bus side, allowing creation of almost any kind of specialized I/O function, including micro-controllers in the FPGA. Several pre-made functions are provided, including a 16 channel host based servo motor controller, a 4 or 8 channel micro-controller based servo motor controller (DSP built into FPGA), and a 8 channel, 32 bit timer counter card capable of running at 200 MHz. VHDL source is provided for all examples. All I/O bits are 5V tolerant and can sink 24 mA. One connector supports LVDS signaling on 10 pairs. Pullup resistors are provided for all pins so that they may be connected directly to opto-isolators, contacts etc. The 5I22 has 96 I/O bits available on four 50 pin connectors, all connectors use I/O module rack compatible pinouts.